A tag is a label assigned to a piece of information. It helps categorise and find data. Tags usually consist of only one term or keyword. Unlike categories or folders, tags are generally not arranged in hierarchies. One advantage is that several tags can be assigned for the same thing. In monkkee, you can tag your journal entries. This allows tagged entries to be found again by searching. In this blog article, we will show you step by step how to do this. To tag your entries, go to the detailed view of an entry. The “Tags” section will appear on the right-hand side or, on mobile devices, at the bottom. 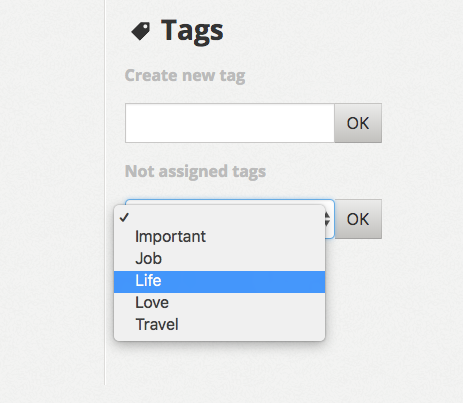 If you want to assign a new tag that doesn’t exist yet, simply type in the field “Create new tag” and confirm with OK. 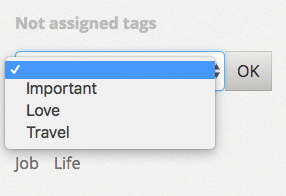 The tag will appear under “Assigned tags”. If you have already created tags and want to add an existing tag to an entry, you can use the “Not assigned tags” selection list and then confirm with OK.
You can assign several tags to an entry. Unfortunately it is not possible to tag several entries at the same time. Just like the journal entries, tags are encrypted and nobody except you is ever able to see the tag names in plain text. You can search for tags via the overview page. 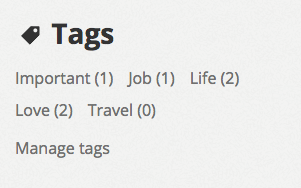 The overview page also has a “Tags” section where all the existing tags are listed. The number in brackets indicates how many entries are labelled with the relevant tag. Click on the tag to start a search. The search works like a filter. Only entries with the corresponding tag will be listed. You can only search for one tag at a time and not combine several tags. To return to the normal overview without filter, click on the “reset” link. If you no longer want an entry to be linked to a specific tag, you can remove the link between the entry and tag. To do so, click on the respective tag under “Assigned tags”. If you are using a mouse, a small minus symbol will appear when hovering over the tag. If you no longer want to use a tag, you can completely remove it so that it no longer appears in the tag search or selection list. 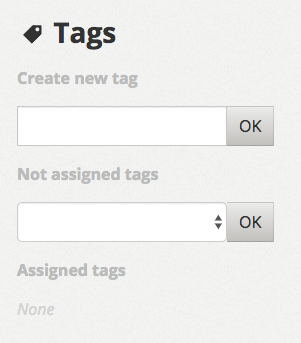 To do so, go to the “Tags” section of the overview page and click on “Manage tags”. Delete the tag from the tag list. If there are still entries connected to the tag, these will of course not be deleted. Only the tag is deleted. Here you can also rename tags using the pen icon. 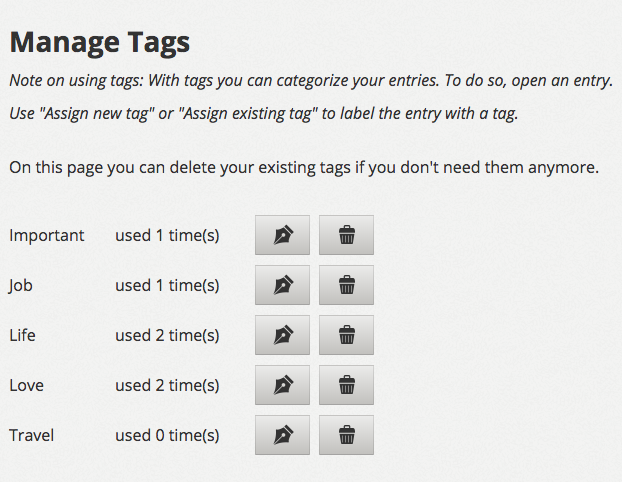 The assigned entries will then be tagged with the renamed tag. 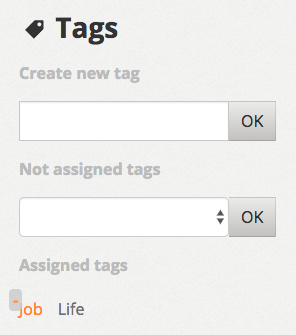 Haven’t assigned any tags yet? Give it a try! Why isn’t it possible to filter entries using a combination of tags? You listed the fact that more than one tag can be attributed to a single entry as an advantage of the tagging system. In my opinion the purpose of a differentiated categorization system made possible by combining several tags for single entries is defeated if the search function is limited to one tag at a time. Being able to categorise entries with tags is great, but I also feel quite an opposite need: a ‘Random Button’ that simply takes you to one of your past journal pages with no criteria other than chance. By the way, thank you for the great work you are doing!